I am in love with strawberries! No, really. I am kind of obsessed with those juicy, red berries. Normally I wait until I can go pick them myself on the field but this time around, I could not resist these organic beauties I got at the farmer’s market yesterday. As I have probably told you multiple times, breakfast is my favorite and most important meal of the day. I always take my time to prepare something wholesome and delicious, no matter how early I have to get up. A morning without a good breakfast can ruin a whole day for me. Yes, I can get very serious about that. So don’t mess with my breakfast! When it comes to food I totally go through phases. Some weeks I’ll only have smoothies with granola for breakfast, another week, it’ll be fruit salads and bread, then oatmeal and fruits…This week it will definitely be this breakfast cobbler. 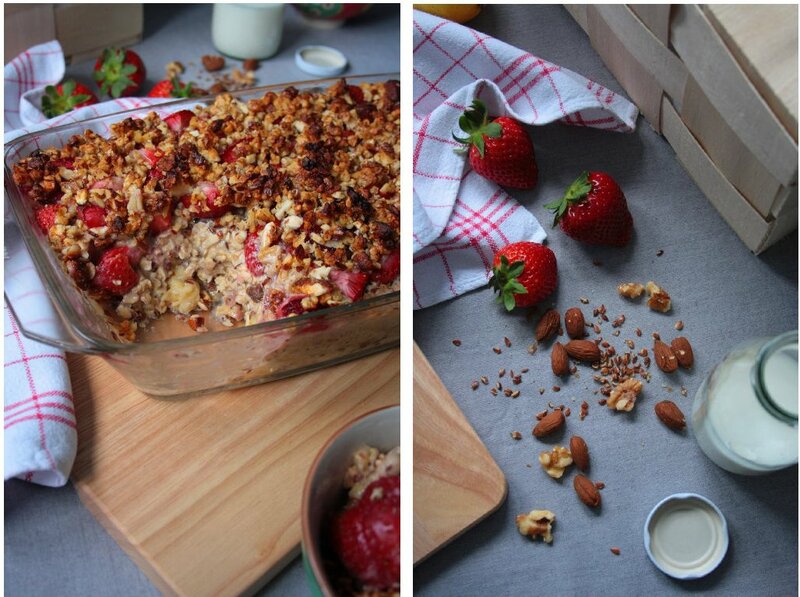 I pretty much made baked oatmeal with strawberries and a crunchy nut topping. It is very filling and since I tend to cook large portions, this recipe makes enough for at least 6 people. For me that means I’ll have strawberry cobbler for breakfast six days in a row. Ha! But you know what? I don’t mind. Because it really tastes delicious and makes my belly very happy (flax and nuts = healthy fats = filling and so good for your body!) . The bananas add a nice sweetness to it, and the lemon zest makes it taste very fresh and summery. Vanilla is a classic with strawberries, so I just had to add it! I could also imagine this cobbler to be a great healthy dessert and a fantastic addition to a brunch. Leftovers should be stored in the fridge. In a large bowl mix oats, flax, raisins, cream of tartar, vanilla, and lemon zest. Stir and set aside. Add nuts into a food processor and pulse to roughly chop them. Combine with apple syrup and coconut oil. Now add milk, water and sliced banana to the oat mixture. Use a fork to combine the ingredients and slightly mash the banana. Put into a greased cobbler, top with chopped strawberries and nut mixture. Bake for 25-30 minutes at 175°C. When the topping starts to turn too brown , cover with a piece of parchment paper.